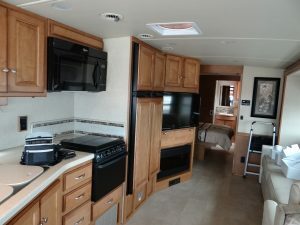 Sorry about not posting lately but we are now working on getting the RV kitted out. 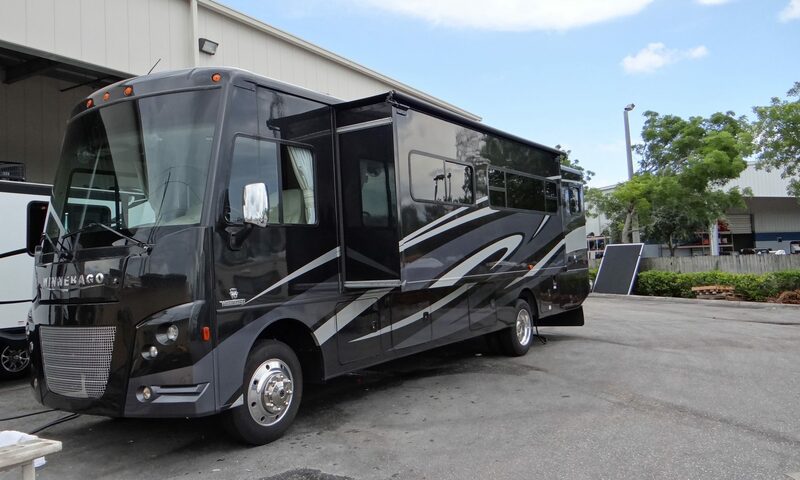 It’s like furnishing a new house, bedding, towels, plates, cutlery etc., so Anne is in her element shopping for the RV and as most of you know I hate shopping, so after 1 full day, Lilia offered to go with Anne so save me!! Thank you Lilia. I have now concentrated on the “blue” things, getting the tow hitch ordered for the Chevy Spark, plus a Tyre Pressure monitoring system for the RV tyres (blowouts on a 6 wheeled vehicle are not a good idea), and we have realised driving around here that is seems to happen quite often, as I95 is littered with rubber bits!! Next task is to buy a toolkit to keep us running, looked around in Home Depot and that puts B&Q to shame (sorry Wendy!!). So much choice and so BIG and that is just the local Jupiter one. 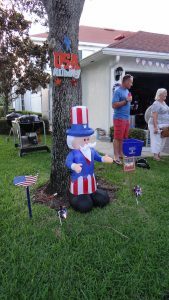 Had a great 4th July with Christopher and Lilia. 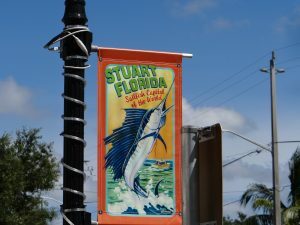 We went to Stuart, just up the coast from Jupiter and ate in the Boat House overlooking the sea. Then we came back and went to two block parties being held by their friends. If you think Bonfire night in the UK is mad you ought to see them over here. 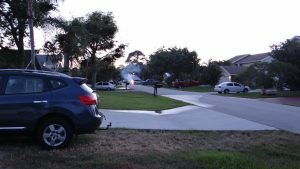 All the neighbours out in the street letting of all sorts of fireworks from pretty ones to very loud mortars. Started about 4pm and there was still some going of at 11pm!! 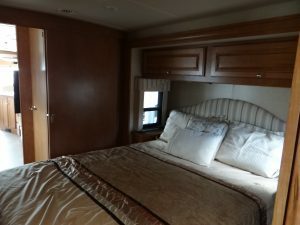 Today (Wednesday) is a getting ready to attend our RV course tomorrow, and then we pick it up and park it on Christopher’s drive (7ft to spare), thank god for the rear reversing camera!! Alan found a YouTube video of our RV. 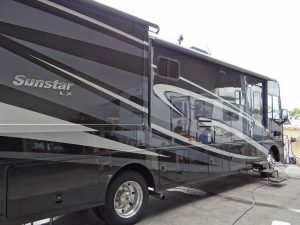 Just in case anyone is interested Alan found a video on YouTube of a dealer showing you around the exact RV we have bought. 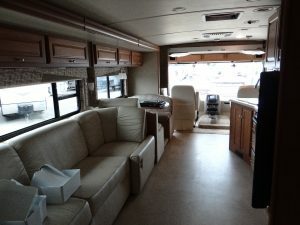 Well after buying the RV the next step is to buy a tow car, so we can travel around towing the car and use it when we are parked on a campground, as even in America it isn’t very practical going shopping in a 35ft RV. After some research we found that it was best on a gas RV (petrol just in case you thought it was running on LPG! ), to buy a light car. So no Jeep Wrangler, Chevy Eldorado and other HUGE vehicles we have seen some people towing!!. We also needed to tow it “4 down” (all four wheels rolling) on an A frame so it is best to get a manual gear shift. Now those of you in the know will realise that manual cars in the USA are quite hard to find. But wonders will never cease we found a dozen manual Chevy Sparks in a 50 mile radius. The best buy seemed to be a 2013 white one at a company called Al Hendrickson Toyota. So Thursday evening we set off with Christopher to the dealership ready to haggle them down from $5,997 asking price. Arrived there and explained to a salesman what we had come to see, and it takes him nearly 45 minutes to find the car in this HUGE lot. Christopher (my nephew) says this is good as they obviously haven’t had many buyers for the car so we should be able to knock them down. So finally the car arrives and it is it good condition and seems to tick all the boxes, so I had a test drive (gear shift on the wrong side!!) and it runs well. So back we go to haggle (or so we thought!!). Sit down with the salesman and they produce an already printed sheet with lots of detail and asking price of $9,877. I must have looked at him gobsmacked especially when he said that was their final offer. So how does a car advertised at $5,977 increase in price by 50%? Dealer fees!! 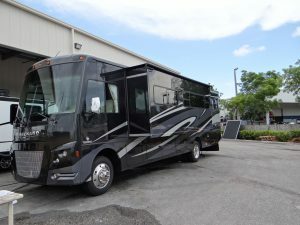 Which included would you believe $980 for nitrogen in the tyres and $1400 for getting the Florida tag (number plate), which we knew for a fact was actually only $400 as that is what we paid for the RV tag. So opening gambit was can you just take the nitrogen out of the tyres and put in FREE air, but no $9,877 was the asking price and they wouldn’t move. So we had no option, and said “thanks, but no thanks” and walked out. Even now when I am typing this I still don’t understand their attitude!! So Friday we phoned our second choice at a company called Pompano Cars. Yes $5,400 was their Internet cash price (15,000 more miles but same year 2013), plus dealer, tax and tag $6900 and willing to haggle. So Anne and I set off (Christopher was working). We arrived to find a silver car in actually better condition than the one we had seen before, had a test drive and it ran really well. Then we started haggling and he showed me what they had bought the car in at and the cost of the servicing they had done, plus for some strange reason it was missing the hood (bonnet) prop which they would pay for. So I asked what was their best price and he gave me the usual about he would get killed if he reduced it further as the internet price was already lower than their original asking price. He would have to ask the dealership owner and he was at an auction. Fine I said we will go away and phone me if you have a deal. We went off to the Post Office and to get something to eat and Jerry phoned back after an hour to say he had a number. Back we went and they offered another $600 dollars off so we agreed to buy it and “closed the deal”. Add the tag, dealer fees and local tax and we had a bargain compared to AJ Hendrickson. So we now have a tow car and can get the hitch etc. fitted. 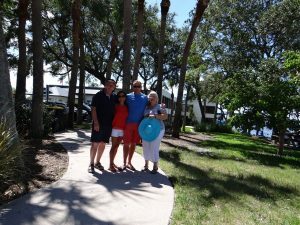 As a codicil to this story AJ Hendricks phoned Christopher back just as we were closing the deal to say they would take $8,400. Guess what the answer was!! 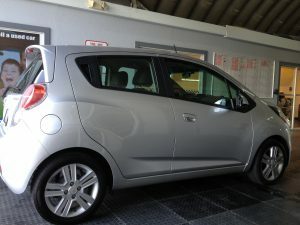 As I said “What a difference a day makes ..” and thank you Pompano Cars and Jerry for being nice people to deal with.